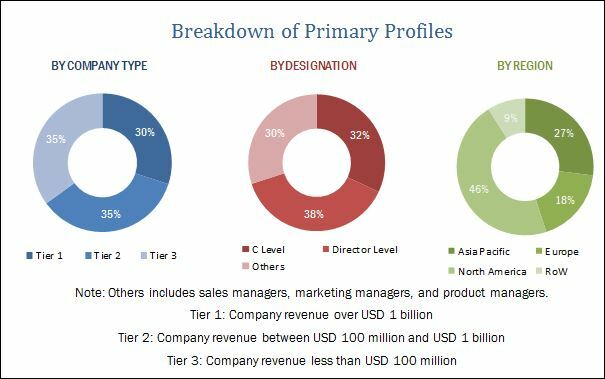 [145 Pages Report] The aircraft cabin lighting market was valued at USD 1.46 Billion in 2017 and projected to reach USD 2.00 Billion by 2022, at a CAGR of 6.48% during the forecast period. The base year considered for the study is 2016 and the forecast period is from 2017 to 2022. The report analyzes the aircraft cabin lighting market on the basis of light type (reading light, ceiling & wall lights, signage light, floor path strips, lavatory lights), aircraft type (narrow body aircraft, wide body aircraft, very large aircraft, regional transport aircraft, business jets), and end user (OEM, aftermarket). These segments and subsegments have been mapped across major regions, namely, North America, Europe, Asia Pacific, Latin America, the Middle East, and Africa. The report provides in-depth market intelligence regarding the market dynamics and major factors influencing the growth of the aircraft cabin lighting market (drivers, restraints, opportunities, and industry-specific challenges), along with an analysis of micromarkets, with respect to individual growth trends, prospects, and their contribution to the overall market. The report also covers competitive developments, such as long-term contracts, new product launches, agreements, and research & development activities in the aircraft lighting market, in addition to business and corporate strategies adopted by key market players. Market size estimation for various segments and subsegments of the aircraft cabin lighting market was arrived at by referring to varied secondary sources, such as IATA publications, market outlook and corroboration with primaries, and further market triangulation with the help of statistical techniques using econometric tools. All percentage shares, splits, and breakdowns were determined using secondary sources and verified through primary sources. All possible parameters that affect the market have been accounted for, viewed in extensive detail, verified through primary research, and analyzed to acquire the final quantitative and qualitative data. This data is consolidated with detailed inputs and analysis from MarketsandMarkets, and presented in this report. The ecosystem of the aircraft cabin lighting market comprises raw material suppliers, manufacturers, distributors, and end users. Some of the key players in the aircraft cabin lighting market are Zodiac Aerospace (France), Diehl Stiftung (Germany), and Honeywell (US). These players have adopted contracts, new product developments, and agreements strategies to strengthen their positions in the aircraft cabin lighting market. 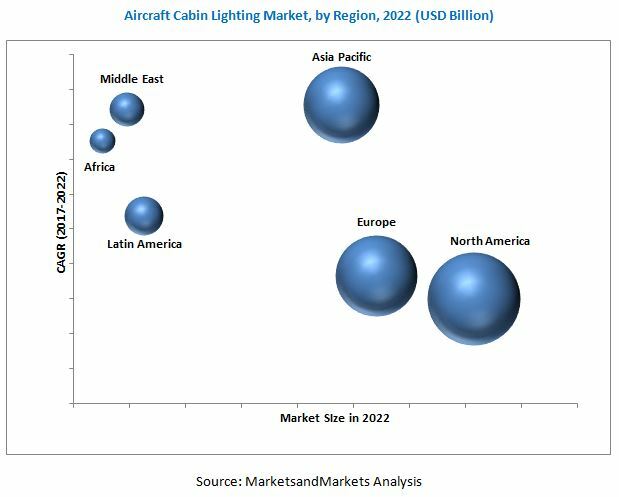 The aircraft cabin lighting market is projected to grow from an estimated USD 1.46 Billion in 2017 to USD 2.00 Billion by 2022, at a CAGR of 6.48% during the forecast period. This growth can be attributed to increasing aircraft orders due to the rise in passenger traffic across the globe. Increasing focus on safety compliance and passenger experience is also among the factors influencing the growth of the aircraft cabin lighting market. Based on end user, the aircraft cabin lighting market has been segmented into OEM and aftermarket. The aftermarket segment is estimated to lead the aircraft cabin lighting market in 2017, and is expected to continue to lead during the forecast period. The OEM segment is expected to grow at a higher rate during the forecast period owing to the increase in aircraft deliveries, mainly in the Asia Pacific region. Based on aircraft type, the aircraft cabin lighting market has been segmented into narrow body aircraft, wide body aircraft, very large aircraft, regional transport aircraft, and business jets. The narrow body aircraft segment is projected to grow at the highest rate owing to the increasing demand for narrow body aircraft in the Asia Pacific and Middle East regions as these regions have seen high growth in air passenger. Based on light type, the aircraft cabin lighting market has been segmented into reading lights, ceiling & wall lights, signage lights, floor path strips, and lavatory lights. The reading lights segment is projected to grow at the highest rate because of the increasing aircraft orders globally and increasing focus on customer experience by airlines. The aircraft cabin lighting market has been studied for North America, Europe, Asia Pacific, Middle East, Africa, and Latin America. North America is estimated to lead the global aircraft cabin lighting market in 2017. Major commercial aircraft manufacturers in North America are Boeing (US) and Bombardier (Canada), and therefore generate a high demand for aircraft cabin lighting products. North America is expected to continue to lead the market during the forecast period. Dearth of profitable airlines in emerging economies is one of the factors restraining the growth of the aircraft cabin lighting market. The major strategies undertaken by various companies include new product developments and contracts. The competitive leadership section compares various companies operating in the aircraft cabin lighting market. Major players in the aircraft lighting market are Zodiac Aerospace (France), United Technologies (US), Diehl Stiftung (Germany), Rockwell Collins (US), and Astronics (US), among others.